Tag Archives for " 16apps "
Iâ€™ve added a weekend post routine that I hope you enjoy. Each weekend I write a post that features 3-4 things I read during the week that I found interesting. Generally speaking it wonâ€™t involve much analysis and may range widely in topic. 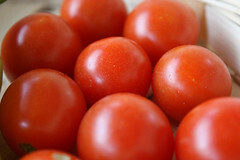 (Flickr image included here is also fav image of the week) – Love my home grown tomatoes this time of year. Free hand drawn social media icons – Love the look of these ink doodle icons to use for your blog. Swebapps – build your own iPhone app in about 10 minutes. Some limitations but a seemingly simple and low cost way to build a basic content app. 16 apps – and sticking with the iPhone theme this service allows you to put your twitter of Facebook username and, based on your usage and conversations, it suggests 16 iPhone apps that might be useful. Seems like this kind of Streamfiltering is a trend that might have lots of applications.